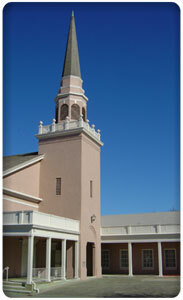 The Christian Science Reading Room for the Hayward area is currently located at the church. We are located at 1814 B Street, at the corner of B and Linden. To get there from Highway 580 heading east, take the Crow Canyon/Grove Way exit and turn right onto Grove Way. At the light turn left onto Center Street. After one long downhill block, veer right at the light onto B Street. Go three blocks and find our church on the right. To get there from Highway 580 heading west, take the first Castro Valley exit and turn left at the light onto East Castro Valley Boulevard. Go one block and turn left onto Grove Way. Going under the freeway, proceed one more block and turn left onto Center Street. After one long downhill block, veer right at the light onto B Street. Go three blocks and find our church on the right. To get there from the San Mateo Bridge (92/Highway 880/ Jackson Street/ Mission Boulevard): If coming on 92 across the San Mateo Bridge, 92 becomes Jackson Street. If coming from Highway 880, take the Jackson Street exit east. Go right (east) on Jackson. Proceed 1.4 miles to the Mission Boulevard intersection; turn left onto Foothill. As soon as you can, move to the right lane to turn right onto C Street. Go one block and turn left onto Second Street. Go one block and turn right onto B Street. (These turns are needed because B Street becomes one-way near Mission.) Our church is about 1/2 mile further on B, on the left. To get there using BART, take the Fremont line to the Hayward stop. Note: This is the downtown “Hayward” stop and not the “South Hayward” stop. Catch Bus 82. Get off at Linden Street. The church is on the corner of Linden and B Street.